A newly synthesized material might provide a dramatically improved method for separating the highest-octane components of gasoline. Measurements at the National Institute of Standards and Technology (NIST) have clarified why. The research team, which included scientists from NIST and several other universities, has published its findings in the journal Science. Created in the laboratory of Jeffrey Long, professor of chemistry at the University of California, Berkeley, the material is a metal-organic framework, or MOF, which can be imagined as a sponge with microscopic holes. 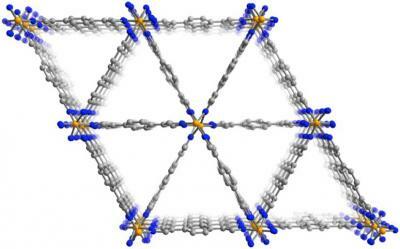 The innumerable interior walls of the MOF form triangular channels that selectively trap only the lower-octane components based on their shape, separating them easily from the higher-octane molecules in a way that could prove far less expensive than the industry's current method. The Long laboratory and UC Berkeley have applied for a patent on the MOF, which is known by its chemical formula, Fe2(bdp)3. High-octane gasolines, the ultra or premium blends at fueling stations, are more expensive than regular unleaded gasoline due to the difficulty of separating out the right type of molecules from petroleum. Petroleum includes several slightly different versions of the same molecule that have identical molecular formulae but varying shapes -- called isomers. Creating premium fuel requires a refinery to boil the mixture at precise temperatures to separate the isomers with the most chemical energy. The trouble is, four of these isomers -- two of which are high octane, the other two far lower -- have only slightly different boiling points, making the overall process both challenging and costly. The new MOF, however, could allow refineries to sidestep this problem by essentially trapping the lowest-octane isomers while letting the others pass through. The lowest-octane isomers are more linear and can nestle closer to the MOF walls, so when a mixture of isomers passes through the MOF, the less desired isomers stick to its surface -- somewhat akin to the way a wet piece of paper sticks to a wall. Matthew Hudson and his colleagues at the NIST Center for Neutron Research (NCNR) used neutron powder diffraction, a technique for determining molecular structure, to explore why the MOF has the right shape to selectively separate the isomers. Their research was essential to validate the team's model of how the MOF adsorbs the low-octane isomers. "It's easier to separate the isomers with higher octane ratings this way rather than with the standard method, making it more efficient," says Hudson, a postdoctoral fellow at the NCNR. "And based on the lower temperatures needed, it's also far less energy-intensive, meaning it should be less expensive." Hudson adds that while industrial scientists will need to work out how to apply the discovery in refineries, the new MOF appears to be robust enough in harsh conditions to be used repeatedly a great many times, potentially reducing the necessary investment by a petroleum company.